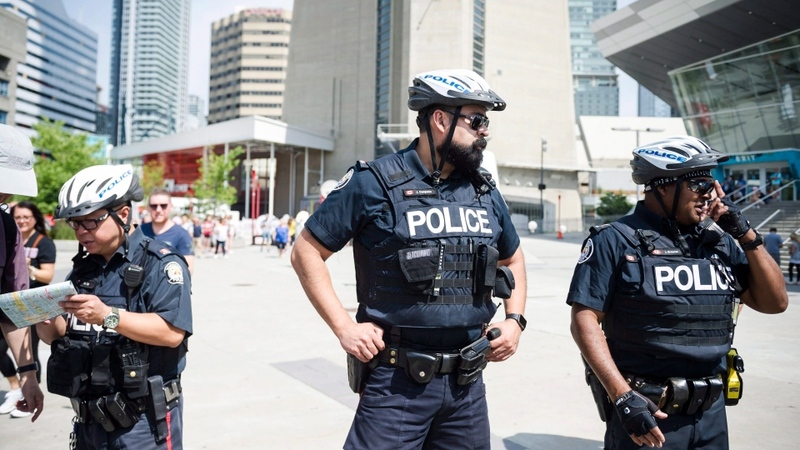 TORONTO -- Black people living in Toronto are far more likely to be injured or killed in interactions with city police, Ontario's Human Rights Commission said Monday as it called on the force to deal with what it described as a serious problem. The findings are contained in an interim report on the commission's probe into racial profiling and discrimination by the Toronto Police Service. After analyzing numbers from the force as well as an agency that investigates police complaints, Chief Commissioner Renu Mandhane said the data -- including a finding that black people were nearly 20 times more likely to die in a police shooting than their white counterparts -- should stand as proof that the force needs to take urgent action. "The Ontario Human Rights Commission's findings ... are disturbing and they demand an explanation," Mandhane said at a news conference outlining the investigation's initial findings. "At this interim stage, we are calling on the Toronto police to acknowledge the commission's very serious human rights concerns." Much of the data in the report was derived from cases probed by Ontario's Special Investigations Unit, an agency that looks into incidents involving police in which someone is killed, injured or accused of sexual assault. 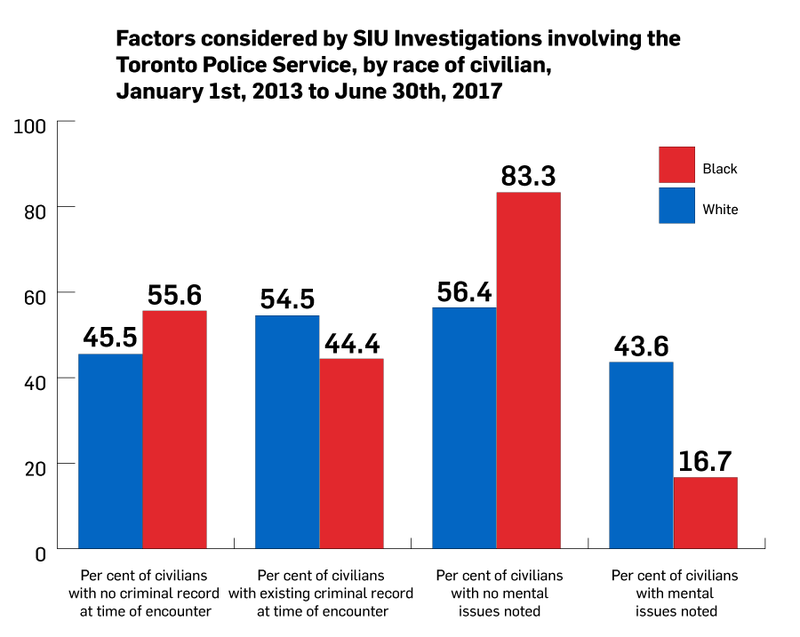 An examination of SIU cases involving Toronto police officers between Jan. 1, 2013 and June 30, 2017 suggested black people's interactions with city police were disproportionate to their representation in the population. The report found that although black residents comprised 8.8 per cent of Toronto's total population, they accounted for 25 per cent of SIU investigations during the time period studied. Black complainants were involved in 28 per cent of all use-of-force investigations, with their representation trending sharply upward as the seriousness of the force used increased. The commission said black people were involved in 36 per cent of police shootings they studied, 61 per cent of police use-of-force cases involving civilian death, and 70 per cent of fatal police shootings. 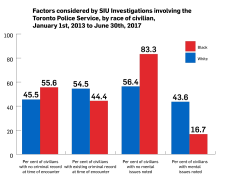 While 67 per cent of all those involved in SIU cases were unarmed at the time, the commission found white people were more likely than black people to be armed at the time of the encounter with Toronto police. In fatal shooting cases, the report found 20 per cent of white people were armed compared to 11 per cent of black people. 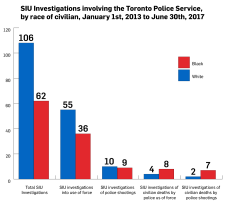 The report further found that 54 per cent of white people involved in SIU cases had a criminal record compared to 44 per cent of black people. Data suggested 62 per cent of white suspects allegedly threatened or attacked city officers compared to 44 per cent of black suspects. The report also suggested black people are overrepresented in cases of inappropriate stops, searches or charges, adding those issues would be explored more thoroughly in its next report on racial profiling. The commission made five interim recommendations, including urging the force and its board to acknowledge that racial disparities raise "serious concerns." It also urged the Toronto Police Services Board to begin collecting and publicly sharing race-based data on all stops, searches and use-of-force incidents, a practice the board has not been observing to date. The force and the board issued a joint statement saying they accepted the commission's recommendations, but noted that the practice of collecting race-based data will require study and consultation. 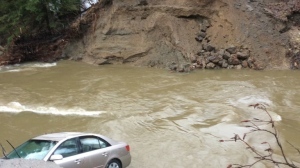 They also said it would be important to "scrutinize" the methodology and data behind the commission's findings, but did not offer any specific red flags. Force spokeswoman Meaghan Gray said the organizations were already taking steps to improve trust with the black community and said the conversation around the issues raised needs to involve questions about poverty, social inequality and the root causes of crime. "Once the police are involved, it is often after all other systems have failed," the statement said. "This is not to say that this explains even a perceived disproportionate use of force by police; but it does highlight the reality that once the police have been called, the incident is often one of crisis." Toronto Mayor John Tory said he was pleased to see the force accept the commission's recommendations and pledged to ensure the city is an inclusive space for all. "Much work has been done over the last few years to improve the police service's policies and procedures that contribute to discrimination and racial profiling," he said. "But much more remains to be done." Valerie Steele of the Black Action Defence Committee said the commission's findings do not come as news to black residents who often take deliberate steps to avoid the risk of needless interactions with police. "What is happening now has been happening for decades," she said. "It is wrong, it is racist, it must be stopped. The time has come."